Room — Hotel rates vary widely throughout the country. I’m staying at the Souchitra Guesthouse on the Mekong River, in a basic room with a fan and bathroom for $6.25 per night (50,000 kip). The cheapest I’ve found was a $3.75 bungalow in Nong Khiaw and the most I’ve paid was $10.00 for a clean, basic room with wifi in Vientiane. $9.00 bought me a nice room with AC and cable TV in both Attapeu and Paksong. If you’re willing to share a bathroom, rates are about 20-30% less. A few of the larger towns have dorm rooms available. Food — There’s a fairly large range in price depending upon whether you eat at a tourist/backpacker restaurant, a local restaurant/cafe, or on the street. The street is cheapest, of course, with a bowl of noodles or rice and vegetables costing $1.25. Main meals at local restaurants are usually in the $2-3 range, while more tourist-oriented places average $3-4 and up. A few nights ago, while celebrating our last night together with some friends, we each splurged on a pizza that set us back $7, and split a bottle of South African wine that cost a whopping $18. For breakfast, I had a huge omelet for $1.50 and an iced coffee for $.50. Lunch was stir-fried noodles with chicken at a local cafe for $2.00 and a soda for $.50. Later in the day, I stopped at a stall for a coke for $.50 and picked up a spicy smoked Lao sausage for the same. Dinner was grilled fish with rice at local cafe for $3.00 and two big Beer Lao for $1.25 each. They have any brand of beer you like, so long as it’s Beer Lao. Beer averages about $1.25 in most places, with some more remote places charging as little as a buck. They have any brand you like, so long as it’s Beer Laos. Lao lao, the potent locally-brewed whiskey, is a real bargain — a 750ml bottle usually costs $1.25 or less. The hangover is free! Unfortunately, fifty cent packs of cigarettes make it incredibly hard to stop smoking. Markets usually have a large food section, where you can sample grilled meats for $.75 and other snacks or doughnuts for as little as 10 cents a pop. Handing a vendor a 5,000 kip note will often yield more food than you can eat. Transport — Getting around town is pretty easy, with tuk tuks charging about $1.25 (10,000 kip) per kilometer (this is double what the locals pay and you can try haggling, but it rarely helps). Bicycle rentals are usually $1.25-$2.00 per day. Renting a scooter varies dramatically from town to town, with some places charging $7-$8 per day, while popular places, such as Luang Prabang asking $15 or more. Small towns with little competition can be tough — here in Champasak, a scooter rents for $12 a day. Haggling is key here, if you are renting more than one bike or wanting it for multiple days. In Paksong, the going rate was $8.75 per day, but my friend and I talked them down to $4.50 because we were renting two bikes for a week. Bus and boat transport in Laos can really tear up your budget. The latest Lonely Planet guidebook is three years old at this point and hotel prices have risen about 50% over what the book lists. Transport and tours have nearly doubled, however — I’d say that bus travel here is roughly 50% higher per kilometer than in neighboring countries. Often, the difference between a crowded local bus and an AC minibus is only 10-20%, so it pays to consider all of the options. A boat from Muang Khua to Nong Khiaw cost $15, nearly double the cost of the bus. Miscellaneous — Tours are very pricey, compared to Thailand and Vietnam — a 6-hour tour of the Plain of Jars in Phonsavan cost $20 per person, while a 8-hour tour covering similar distances was only $9 in Vietnam. Tubing the river in Vang Vieng costs about $7, which includes a single $1.25 tuk tuk ride and a $1 tube rental — the farang tax here is pretty high for touristy activities. Many sites, such as caves or waterfalls, have a small entry fee — usually $.50 or so. Some will try to double-dip, charging you for entering the site, then charging again for parking. The most I’ve paid was for $3.75 for the Wat Phu complex here in Champasak and it was worth every penny. Free wifi is pretty hard to find and you’ll often have to seek out a internet cafe for $.75-$2.00 per hour. If you do find a restaurant with free wifi, the food and drink prices are usually 40-50% higher than the average. While not the incredible travel bargain that it may have been only five years ago, Laos is still an easy and inexpensive place to visit. But get here soon, because it’s growing up fast. .-= Nick´s last blog ..Adding Simple CSS Rules For Printing And Mobile Browsing =-. Great breakdown! Thanks so much! Heh. Austin comment above made me chuckle because my first stop on my digital nomad journey is…Austin. Then San Francisco for a couple months but after that I’m off to SE Asia, including Laos. Having never been to Asia before, I am starting off in Thailand. I’ve done the backpacker thing through Europe for a year, so that part will be easy. I reckon the culture shock may be the toughest but I’m pretty resilient. Thanks a bunch for the cost breakdown. It really is amazing to me that Americans (like me) take for granted how strong our economy is, despite how much we like to complain about it. These cost breakdown posts really fascinate me. Wow, that is cheap. Curious what your budget was in Luang Prabang, that place is pricey(relatively speaking) and your quite off the grid right now, yes? .-= SHABL – Rob´s last blog ..Dirtiest Hostel I Stayed at in Asia =-. Well… in my defense, they *are* big beers :) I’ve definitely had to cut back on beer for budget purposes — they really add up. Great breakdown! Reading peoples budgets are one of my fav type of post its just so interesting and crazy to see how cheap things really are! Thanks for posting these for the countries you visit! .-= Jaime D.´s last blog ..7 most FAQs about my RTW trip =-. I see Laos has improved! Overall, that’s $500 a month. Not bad. When I was there, the rooms were more, $8 to $10 for example. And yeah, 2 beer a day is sad at those prices. Get drunker would you? .-= Nomadic Chick´s last blog ..How To- Live Like a Nomad in Your Own Country =-. Hey, this is really handy for planning purposes, thanks! God I wish I there right now! Wes, I just returned from Laos and I can tell you that prices have gone up cosiderably since you went there. I found Thailand and Vietnam a lot cheaper than Laos…but it was worth every penny, I really enjoyed this country, specially Luang Prabang. Thanks for sharing! I am living in Korea right now teaching English, and I am going to move to either Thailand or Vietnam in September to pursue my digital nomad dreams. 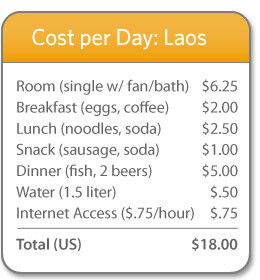 Laos will def be on the radar, and it’s good to see how affordable it is!